Movie: "The Death of "Superman Lives": What Happened?" 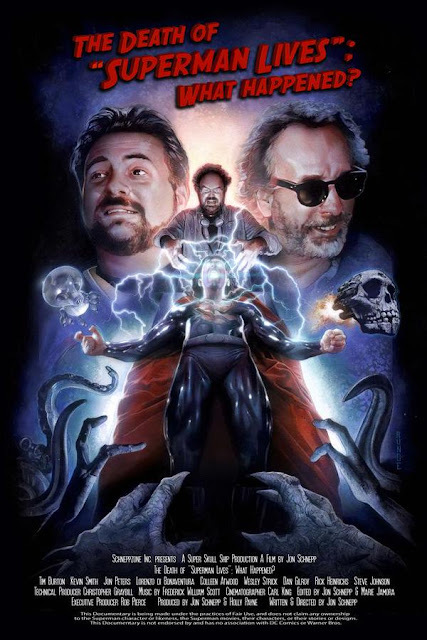 A series of interviews conducted with those involved, ranging from producers to the film's intended director Tim Burton, in order to find out what happened behind the scenes during the production of the never-made film "Superman Lives." Documentary director Jon Schnepp was always fascinated about what could have been with this film and set out to interview those involved to find out just what happened that dismantled the project. To hear that there was a time when Nicholas Cage, one of the best damn actors of our generation* and internet meme extraordinaire, was going to star as the Man of Steel was certainly enough to pique our interest. Before we saw this documentary, we couldn't think of a worse, less capable actor to play Superman than Nicolas Cage. This is not to say he's a bad actor, but his over-the-top, sometimes spastic method acting doesn't exactly scream Superman. We don't like to judge people for parts based on how they look, but we're having a hard time thinking of a less Superman-esque looking actor. Cage's appearance is best suited for parts like psychopaths, convicts, and killers. To say "Superman Lives" would have taken an unconventional approach to the character is an understatement to say the least, and now knowing the intended vision for the film, Cage may have actually been just the right choice for such an off the wall, different part. In this documentary, Jon Schnepp interviews many of the people who were involved in the production of "Superman Lives," including its would-be director Tim Burton. We personally love Tim Burton, and though he did a good job with his two Batman films, the darker, more brooding nature of that character certainly seemed more up his alley than Superman, who has to essentially be a purely good character born from the light. Multiple writers did work for the script, including another one of our favorites Kevin Smith, who came up with the title "Superman Lives" even though he was eventually fired when Tim Burton entered the project. The whole production was the brainchild of producer Jon Peters, who bought the rights to Superman when Warner Brothers accidentally let them lapse. This is just one of the wacky, serendipitous happenings that almost allowed "Superman Lives" to be an actual movie. Peters' vision for the character was sprung from a very intricate, interesting story, and to see all of the work that went into this production long before shooting was ever even started is a little more than crazy. Using behind the scenes footage, we get to see Superman's costume designs and some mocked up set pieces, the model Skull Ship being one of the coolest things designed for it. We see production and character design sketches that really gives us a feel for what direction this film was heading. While intricate source material details from Smith's script were added for true fans of the man of steel like him, Peters had insane ideas like the inclusion of a gigantic spider Superman must fight that was a deal breaker for the script. Now that we know what was to be, we have to say we're glad this movie never saw the light of day. We also learn a lot about what goes on behind the scenes of a major production such as this. It's very telling and interesting to see how a series of bad decisions at Warner Brothers, upon releasing box office bomb after box office bomb, eventually brought the production of "Superman Lives" to a screeching halt. Though we feel like this is the movie people deserve to see for its sheer and utter difference, in the end, it was for the best. The direction the film was headed was so far away from its source material that it would have caused a tidal wave of nerd rage that would've drowned anything good this film may have had to offer. And remember, this was all supposed to happen in a time before the internet, message boards, and trolls were so heavily prevalent like they are today; we have a hunch the aforementioned nerd rage would have still sprung from the loin of whatever dark, seedy corner of society that was used to complain in the mid-90's. As "Superman Lives" died, we eventually got "Superman Returns," and the only thing that came from "Superman Lives" was the choice to cast Kevin Spacey as Lex Luthor, which is probably the best idea to come from either movie. In the end, Schnepp tells this story in an intriguing way, but we have a hunch it won't be for everyone. The background music is sort of cheesy, and you have to be into nerd culture references and the subject matter to be truly interested, but overall, it's an eyeopening look into Hollywood's development hell for one of, if not the, biggest superheroes ever created. * - term used loosely and in sarcasm. One year ago, we were watching: "The Fast and the Furious"